I am just loving this Irresistibly Yours Specialty Designer Series Paper you can get for free. You can get a package for free when you spend $50.00, before shipping and taxes, during our big Sale-A-Bration event. You have until March 31st to place your order. Keep checking back to see cards made with the other designs in this paper pack. For this card, I sponged Crisp Cantaloupe on the resist paper and layered it on Whisper White. I used Crisp Cantaloupe ink to stamp my sentiment from our stamp set, Really Good Greetings. Stampin' UP! has a wonderful thick bakers twine in our 2013-2015 in colors. 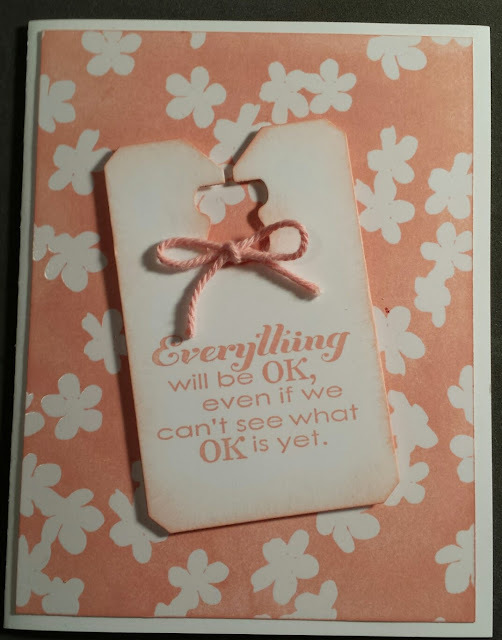 I used my Big Shot and my Chalk Talk Framelits to cut out the sentiment and popped it up with Stampin' Dimensionals.